Over the last week, more and more details have come out about what makes the ZR1 so special and unique. One of the main points of focus for Corvette engineers was to address the cooling issues that many Z06 owners complained about when tracking their cars during high ambient heat conditions. “Managing the airflow around the car was a huge emphasis,” explained Executive Chief Engineer Tadge Juechter. “This is the first time we’ve spent this much time with a moving ground plane wind tunnel.” Producing all of that heat is the ZR1’s LT5 engine which utilizes a 2.65-L Eaton twin-scroll supercharger that beathes though a 95mm Hitachi throttle body that was specifically engineered for the ZR1. The LT5 engine also utilizes a dual fuel injection system consisting of direct injection which is the primary system and a high-flow port injection system which provides fuel at excessive engine loads. This type of dual fuel injection system is a first for General Motors. The LT5 engine exhales through a new two-stage muffler system incorporating both active and passive modes. As a result, this is “the loudest and most aggressive-sounding production Corvette in history.” This employs new technology for which “we’ve applied for and expect to get some patents,” said Juechter. 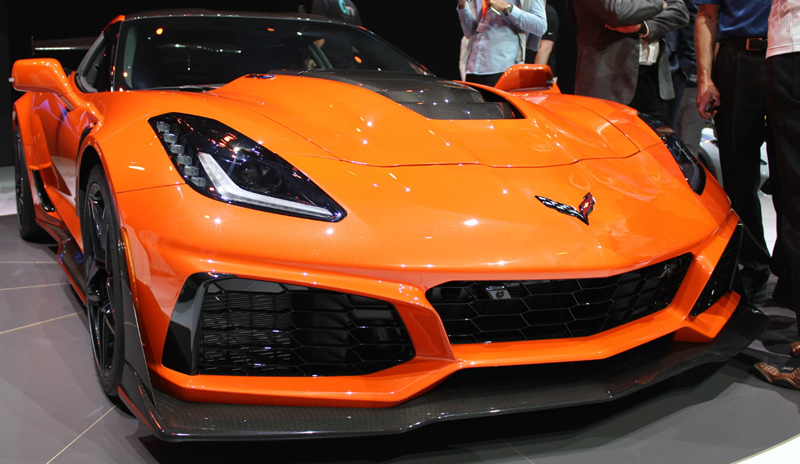 Ron Kiino from Chevrolet Communications has confirmed that the ZR1 will not utilize the C7 Corvette’s Active Fuel Management system (cylinder deactivation). To help keep the ZR1 planted firmly to the ground, is a new ZTK Performance Package which utilizes Magnetic Selective Ride Control from Beijin West Industries, Michelin Pilot Sport Cup 2 tires and Brembo carbon ceramic brakes. Both the tires and brakes were specifically designed for the ZR1. 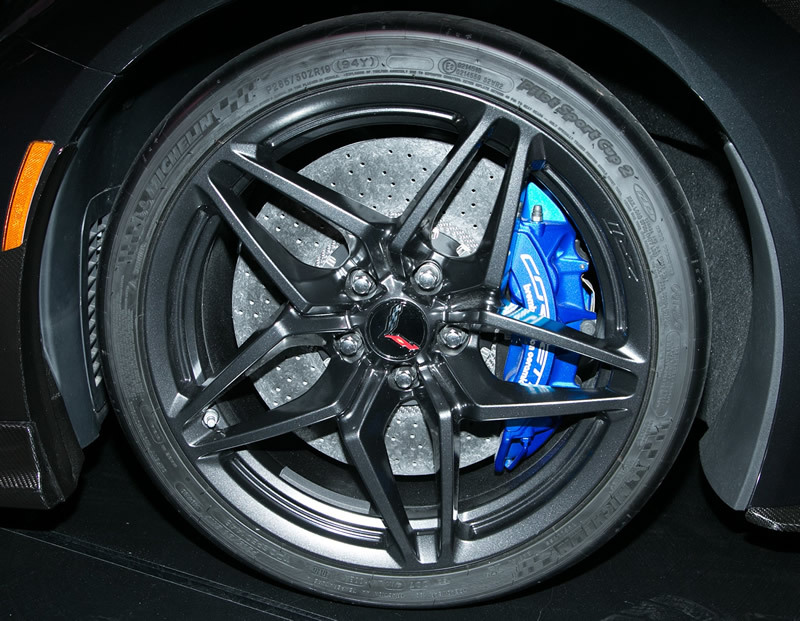 The brakes were specifically designed by Brembo in order to meet the ZR1’s intense performance level. The size of the fixed aluminum calipers hasn’t changed from the one that the Z07 equipped Z06 Corvette uses, however the actual brake rotors and pads have been enhanced to provide additional track capability. The front carbon-ceramic rotors utilize a special heat treatment process in order to improve resistance to higher thermal load and increase the heat dissipation under heavy track conditions. Both front and rear brake pads are composed of new formulations that were developed under the guidelines of the Brembo R&D Center with the sole purpose of providing much higher stopping power and better pad wear under extreme track conditions. “We are very excited about the 2019 Corvette ZR1,” Dan Sandberg, Brembo North America President and CEO said. “When you have 755-horsepower in a track proven street car there are a lot of demands on the braking system. It has to perform at a track day at Sebring as well as provide quiet stopping power driving down Main Street.” The ZR1’s Brembo brake system consists of front 6-piston monobloc calipers with 394mm x 36mm carbon ceramic disc, and rear 4-piston monobloc calipers with 390mm x 32mm two-piece discs which are also carbon-ceramic. Customers will be able to order six custom caliper colors including black, red, yellow, gray, blue and orange. Looking at the ZR1’s skeletal structure, we see that the ZR1’s entire front-end is unique, providing enormous openings for 13 heat exchangers which is four more than what the Z06 Corvette uses. Because of the height of the hood due to the larger supercharger, the ZR1 does not meet pedestrian protection-compliance regulations in Europe, and as a result, will not be sold there. The frame structure beneath the hood is also changed to accommodate outboard heat exchangers added on the left and right sides in addition to the existing central radiators. Working in conjunction with the enormous rear wing of the ZTK package is exposed carbon fiber elements manufactured by deBotech, Inc. A front underwing with an inverted wing is used for maximum downforce which replaces the standard flat splitter. All in all, this will be one of the most exciting Corvettes we’ve seen in a while and we can’t wait to see what kind of performance numbers this beast will be able to put down!